Huge quandry....$1200 in hand......new guitar or amp??? Discussion in 'Guitars in General' started by jimmyohio75, Sep 8, 2008. OK, so I have been putting some $$$ away into a rathole fund for about 6 months and right now I am sitting on around $1200. I am definitely getting some new gear but I am torn. 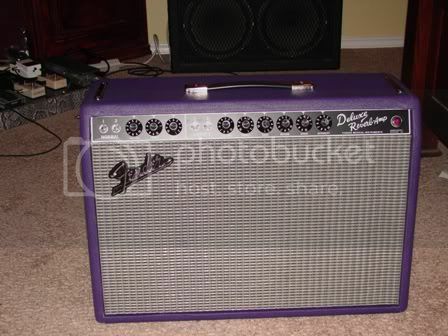 Should I get a sweet new strat(always wanted an American Deluxe v neck) or should I get a new amp(been considering a Fender Supersonic or '65 Deluxe Reverb Reissue). I am very happy with my current setup. I have a Deluxe Lonestar strat and an Orange Rocker 30 amp. I have been gigging with this setup and I have no problems. I have always wanted an American Deluxe strat but have held off buying one because the MIM Lonestar is so damn sweet. The Rocker 30 is an awesome amp but IMO is lacking a bit in the clean department, i.e, it's not a Fender. So let's here some arguments for both sides. Do I go for the guitar or a new amp??? Sounds like you need cleans more than another Strat to me. So, to that end, SUPER REVERB! I agree, I think you're going to need a different amp to get the clean tones you're after ... but if you went the DRRI/SRRI path, what would you do to replace the OD that the Rocker does so well? With $1200 squirreled away, how much could you raise by selling the Rocker and the Strat that you have? Could you raise enough for an amp and a strat upgrade? Hmmmm....interesting. A new amp AND strat! I could probably get $700-800 for the Orange and only about $250 or so for the Lonestar. Add that to the $1200 I already have and that gives me roughly $2250 to work with. Of course selling the Orange and getting any Fender except the Supersonic means buying a distortion pedal to achieve the ZZ Top type grind I will need for gigging. I could probably talk GC down to $1100 on a Supersonic which leaves $1150 for a strat. I could probably also talk GC down to $1150 for the much desired Am Deluxe strat that I want. You guys are killin' me. I am a gear junkie and I can't stop!! I say upgrade them both! Edit: Didn't notice the more cleans..Get a Twin Reverb! Did you max out your IRA for 2008 yet? Yep, this money is strictly "under the radar" money that I've been squirrelling away from the wife. If I take large sums all at once or if I finance anything the wife catches on and I'm busted. I think GC stock them ... I was impressed and I'm fairly biased towards amp overdrive.